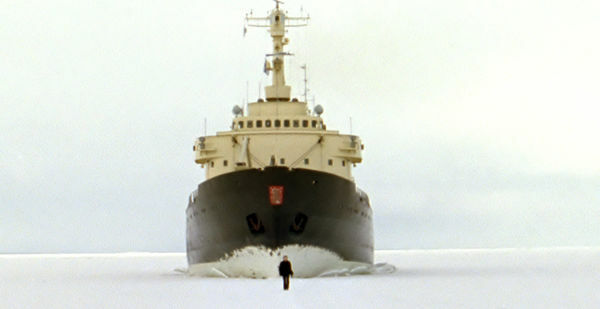 “Dutch artist Guido van der Werve makes the kind of films Caspar David Friedrich might have dreamt up if he had had a sense of humour and access to a camera. Saturated in an atmosphere of melancholy, loss and loneliness, preoccupied with dead composers and centuries-old dance forms, yet fired by a love of both the piano and slapstick, Van der Werve’s beautifully shot vignettes include: the hapless artist narrating the history of Steinway pianos while sitting mournfully on a piano stool; trudging slowly before an icebreaker in the Gulf of Finland; standing for 24 hours at the geographic North Pole, refusing to turn with the world, surrounded by stately dancing ballerinas after being knocked down by a car on a depressing suburban street; and meditating on meteorites while building a space rocket in his living-room. The films are usually accompanied by Romantic piano music played by Van der Werve, who trained as a classical musician. Frédéric Chopin is his favourite composer (because ‘his music often sounds very simple, and I think you have to reach a really high level of understanding in order to be able to do that’), although he is also fond of Sergei Rachmaninov, Sergei Prokofiev and Wolfgang Amadeus Mozart. Recently he has begun writing his own lush scores. Happily, despite skating close to pathos, Van der Werve’s films never quite fall into it. A crescendo of melancholy can abruptly shift key and tone and segue into a light-hearted mood of absurdity at the least predictable of moments. In the classic tradition of slapstick Van der Werve’s films are fuelled by the creative possibilities of aural and visual dislocation, or, more simply, by an awareness of how simultaneously lonely and absurd life can be and how much solace can be found in abstract forms of expression. Witness, for example, the shifts in mood, setting and meaning, in the 12 minutes of Nummer vier: I don’t want to get involved in this, I don’t want to be part of this, talk me out of it (2005). The film opens with words, spoken in Dutch and written in English on a black screen: ‘I woke up early and watched the sun rise. I felt it came up just for me.’ Cut to an image of the lonely back of the artist; he is gazing out over a slate-blue sea. Very slowly the camera pans up to the sky; a small plane flies by, dragging behind it a banner emblazoned with the words ‘it was not enough’. Cue the achingly wistful chords of Chopin’sNocturne No. 1 in B flat minor, performed by the artist. 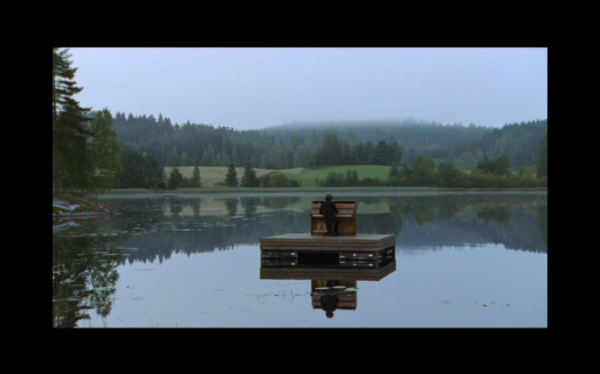 The camera gradually pans down to an image of Van der Werve playing the piece on a slightly out-of-tune upright piano, perched on a pontoon in the middle of a misty lake. When the piece comes to an end, the scene changes to a barge drifting down a river. Gradually the faint strains of Mozart’s Requiem Mass are discernible, and it is apparent that the choir and orchestra performing the piece are actually on the boat. Intimations of death, and more particularly the island of the dead, become overwhelming. Eventually everyone disappears, and we are left with the gentle sounds of wind and birds. Then, without warning, the artist drops from the sky and into the river. 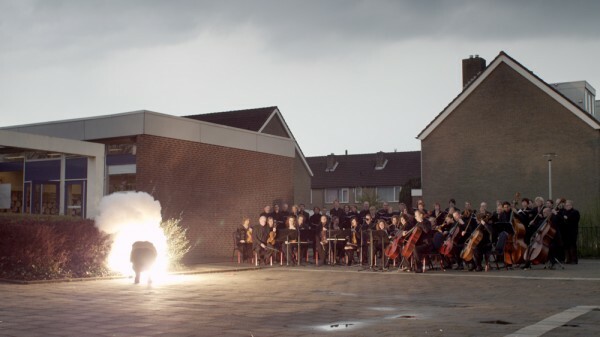 The entry 'Guido van der Werve' was posted on May 11th, 2014 at 10:00 pm	and last modified on May 12th, 2014 at 11:48 am, and is filed under Uncategorized. You can follow any responses to this entry through the RSS 2.0 feed. Both comments and pings are currently closed.